Samhain was not the name of a "Lord of the Dead", no historical evidence has ever been found to back this up, it was simply the name of the festival and meant "Summer's End". It was believed that the souls of the dead were closest to this world and was the best time to contact them to say good bye or ask for assistance. It was also a celebration of the harvest. It is still treated as such today by those who practice Wicca or other nature based religions. It has absolutely nothing to do with satan, who was a creation of the Christian church. When European settlers, particularly the Irish, arrived in America they found the native pumpkin to be larger, easier to carve and seemed the perfect choice for jack-o-lanterns. Halloween didn't really catch on big in this country until the late 1800's and has been celebrated in many ways ever since! It’s especially popular in warm weather locales. However, its available everywhere. Here’s an excerpt of an article that appeared in Boat US a while back covering the pluses and some drawbacks. First, ease of use. You call ahead to have your boat brought down and even fueled. Then you arrive, hop in, and go. When the day is over, you return to the marina, dock the boat in the designated area, and leave. The marina washes it down and puts it back up on the rack. Second, it may save money. Since you don't have a trailer, you're not spending money on gas, launch fees, or upkeep on the trailer. Also, because your boat isn't sitting in the water, you won't have to clean off the marine growth or bottom paint the hull every year. Third, it keeps your boat in better shape. If your boat is sitting in a big steel barn and not constantly being bombarded by the sun's UV rays, you are lessening the possibility of gelcoat damage. However, keep in mind that if your boat is in a three-sided shed or a rack with just a roof, some sunlight might get on your boat. Fourth, it's good protection for your boat. Most buildings have security measures like electronic security systems to stop vandalism and outright boat theft. Many of the newer buildings have fire suppression systems from sprinklers and even synthetic fire retardant foam systems. Also, many buildings in hurricane-prone zones have been built according to local hurricane codes. If you keep your boat in a hurricane-prone area, check to see what kind of protection the rack facility offers. Fifth, it provides alternatives to keeping a boat and trailer sitting in the driveway. Due to homeowner association by-laws or city ordinances, some small boat owners can't keep their boats in their driveways. In addition, dry stack storage is good for owners who find themselves being kicked out of marinas to make room for larger yachts. Last, it may be environmentally better in some circumstances. According to Delaware State Parks' Indian River Marina, dry stack storage "Minimizes need for dredging, minimizes water quality and flushing concerns, and reduces the amount of contact time between pesticide-containing bottom paints and the water." Of course, as with everything, there are some downsides. Most places only allow you one launch and retrieval per day. That launch time can get long if the dry stack is extremely busy that day. Also there usually isn't any place at the facility to park your boat in the water and use it overnight. Also, you can't just show up at the facility and tinker around on your boat. 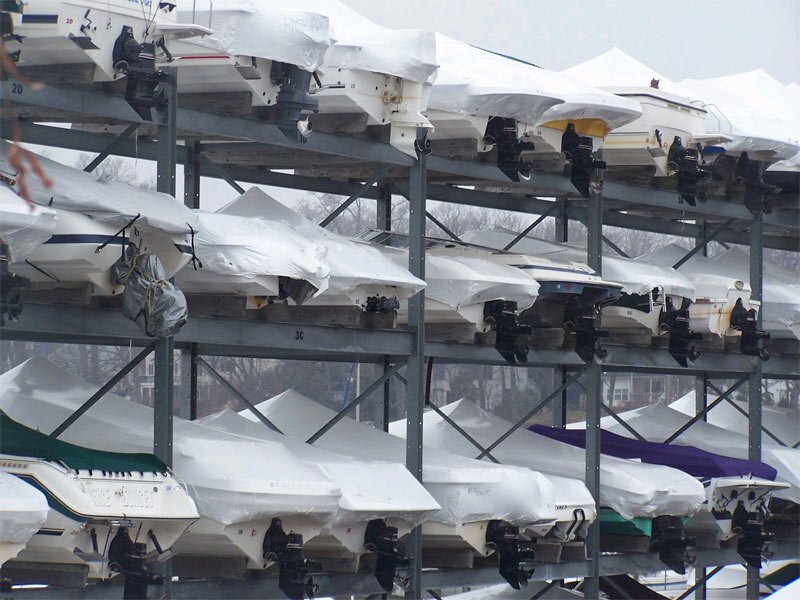 Most dry stacks don't allow boat owners to work on their boats in the facility. Every year as we roll into October, we come face to face with our candy demons. For me, October's candy temptation arrives in the form of a little tri-colored mellocreme known as candy corn. The National Confectioners Association reports that 35 million pounds are produced annually. That's 9 billion pieces. The innovation in candy corn was the layering of three colors. This made it taxing to produce (all those colors had to be layered by hand in those days). But the bright, layered colors also made the candy novel and visually exciting. In the early days, not everybody called it "candy corn." Some people called it chicken feed. Goelitz's packaging(the original manufacturer) from the 1920s featured a proud rooster scratching around in the candy bits and the motto "King of the Candy Corn Fields." (image) The thing is, corn wasn't something Americans ate much of before World War I. There were no sweet hybrids in those days. Corn was coarse and cheap and not very tasty: good food for pigs and chickens. It wasn't until war-time wheat shortages in 1917 that any but the poorest Americans would have considered corn flour, corn meal, or corn bread acceptable foodstuffs. Candy corn, on the other hand, quickly became one of America's favorite treats. Through the first half of the 20th century, candy corn was first and foremost a variety of "penny candy," those inexpensive candies sold in bulk, primarily for children. A penny or a nickel would buy you a nice little sack in virtually any candy shop or drugstore. Today Brach's and Jelly Belly (formerly Goelitz) are the only national brands of candy corn, but throughout the 20th century many major candy companies included candy corn in their offerings. As Halloween became more and more dominated by candy beginning in the 1950s, candy corn increasingly became the candy for Halloween. There was a dramatic spike in October advertising of candy corn beginning in the 1950s. Other kinds of candy were advertised for Halloween too, but they were advertised just as heavily during the rest of the year, and the more people thought of candy corn as a special Halloween treat, the less likely they were to consider it for ordinary eating at other times. Native American Indians used pumpkin as a staple in their diets centuries before the pilgrims landed. They also dried strips of pumpkin and wove them into mats. Indians would also roast long strips of pumpkin on the open fire and eat them. When white settlers arrived, they saw the pumpkins grown by the Indians and pumpkin soon became a staple in their diets. As today, early settlers used them in a wide variety of recipes from desserts to stews and soups. The origin of pumpkin pie is thought to have occurred when the colonists sliced off the pumpkin top, removed the seeds, and then filled it with milk, spices and honey. The pumpkin was then baked in the hot ashes of a dying fire. What happens when someone who may be familiar with house wiring works on a boat and isn't familiar with boat wiring? In a house, the neutral and ground wires are connected together at the fuse box. But on a boat, this is a serious safety concern, and especially in freshwater, it's potentially lethal. Tying the neutral to ground could allow 120 volts of deadly AC current into the boat's ground and bonding system. If there's also a problem with the safety ground going ashore (not unheard of in marinas), all the underwater metals of the boat can be energized with 120V shore power. This can result in electricity in the water and, especially in freshwater, could injure or even kill nearby swimmers. Called electric shock drowning (ESD), the energized boat hardware creates a large electrified circle around the energized boat. When a person in the water enters that circle, he or she becomes paralyzed, loses the ability to tread water, and may drown. The other clue that this installation was not done by a boat pro is that the wire is typical "Romex" solid-core type that's fine for a house, but because it's not made from stranded, flexible wire, can be subject to cracking from vibration and become a fire and shock hazard on a boat. Dual batteries offer redundant starting capability. However not all batteries are the same. A multiple-battery system’s best attribute may be the ability to provide engine starting should one battery short out, experience a wiring failure or simply get drained. The capability to run electronics, lights and stereos for longer periods also proves beneficial. Consider these multi battery features whether shopping for a new boat or retrofitting your current boat. The charging characteristics vary between battery types: absorbed glass mat (AGM), flooded cell and gel cell. Integration with engines, chargers and other components is easier if all batteries are the same type. For most boaters, a pair of dual-purpose batteries serves as a good foundation. A ­starting battery and a deep-cycle battery, or bank of batteries, might serve a bass fisherman, or other boater with high accessory demands, better. Ensure sufficient starting amperage by checking your engine’s owner’s manual for the appropriate capacity. Selecting the deep-cycle battery’s — or bank’s — size is more ­involved. Basically, you need to add up your anticipated amperage draw and assume a period of time you’ll need that amperage to flow. Manual switches are reliable but require you to remember to manually switch between batteries (or banks) in order to keep all batteries charged. Batteries should be accessible to the extent that they can be serviced and inspected without removal from the boat. Even if you do not perform your own service, good access will save you because it will take the technician less time to perform the task. The closer to the engines the batteries are, the better. Batteries should be ­robustly secured, be located where there is some ventilation, and not be installed directly ­underneath a battery charger or fuel-system fixture. Cable diameter is directly related to a dual-battery system’s performance. There are formulas you can reference for determining the size of cable based on the amperage it must carry and over what distance. Suffice to say, thicker cables, which exhibit less voltage drop, are generally better, so when comparing the systems in two similar boats, compare the cable diameters. What’s the difference between battery classifications? This is a thumbnail sketch. Starting batteries deliver high amperage for quick engine starts but do not tolerate being used to power equipment. Deep-cycle batteries can be drawn down without damage to power equipment but may not provide enough amperage in a burst to start the engine. Dual-purpose batteries offer the ability to provide a lot of amperage in a burst for engine starting, but they do not provide equivalent performance to a deep-cycle battery for running equipment. WHAT SYSTEMS NEED TO BE ADDRESSED WHEN STORING?